The M16 Mk. II is a large-diaphragm tube condenser microphone with a 9-way pattern-selection switch on the PSU. Telefunken USA introduced a lower-cost line of microphones under the name “R-F-T” (for Radio Fernseh Technik, an old German brand). 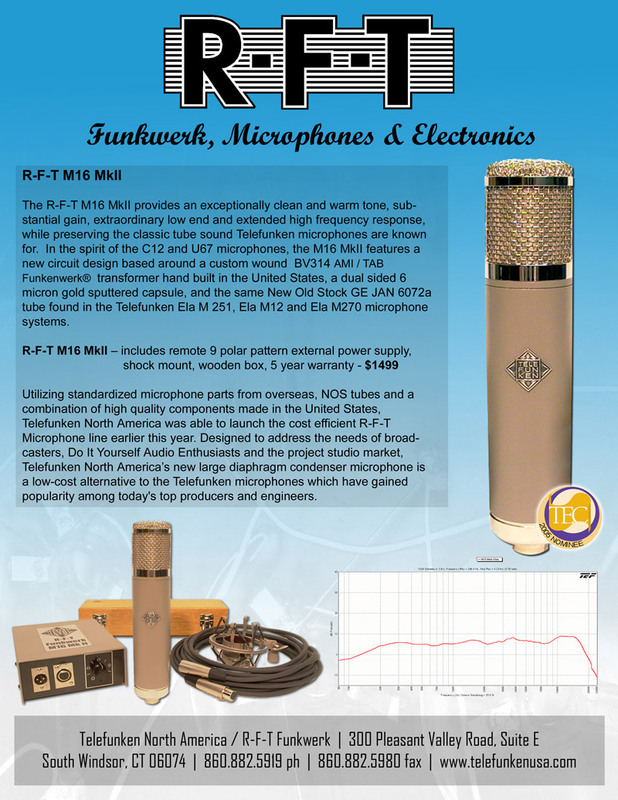 The idea for the R-F-T line was to combine “overseas” parts and manufacturing with selected American- and European-made components in order to provide high-quality mics at a hobbyist price point. The original M16 (later designated “Mk. I”) was introduced in January of 2005 at an MSRP over $1000. It was a rebadged catalog item from one of the mic manufacturers in China. Dan Richards’ teardown expose revealed that the M16 was functionally identical to the $200 Apex 460. Telefunken USA quickly responded by introducing the “M16 Mk II,” in which every component but the capsule was upgraded. Telefunken USA smartly offered a free upgrade for all M16 Mk. I owners. a new amplifier circuit based on AKG’s C12. It was designed by Oliver Archut at AMI/TAB Funkenwerk. the same New Old Stock GE JAN 6072a tube found in the Telefunken Ela M 251, Ela M 12 and Ela M 270 microphones. The M16 is using a circuit as close as possible to the C12 with an AMI custom transformer — a slight variation of the original C12 x-former, the Hiller style T14. Upgrading the capsule is quite a challenge; the one that is stock in the M16 is pretty hard to beat. The capsule model is “TK67,” a 32mm dual-diaphragm design inspired by and named after the classic Neumann K67 design. (Note that the Neumann K67 is a 34mm capsule.) It is a Chinese-made capsule, and can also be found in the company’s AK47 microphone as well as the M216 series of stereo tube microphones. As with most other HST-11A clones and descendants, the RFT M16 is a 9-pattern mic, offering Cardioid, Omni, Bidirectional, and six in-between pickup patterns (via a switch on the power supply). The M16 Mk II tube condenser mic has a strong personality, not to mention impressive vintage looks and build quality. Around the studio it delivered a useful presence enhancement on a variety of tracks and never sounded muddy or undefined. However, the mic possessed little of the harmonic richness or smooth, silky highs that top-dollar tube mics are known for… Recordists favoring a bright pop timbre — particularly on female vocals and lead instruments — may take a shine to the M16 Mk II due to its glossy highs and gradual bass rolloff. The tonal variation provided by the multiple patterns adds value and versatility to this affordable tube mic. The Telefunken Elektroakustik R-F-T M16 Mk II is also known as: M16MkII, ElaM16.